News of the Lenovo IdeaPad K1 tablet has been popping up recently, and now it appears that the tablet was available for pre-ordering on certain online retailers. According to SlashGear, the K1 tablet was available for pre-order at Amazon for $499 with no shipment date listed. Unfortunately, as of this writing Amazon has taken down the product page and the tablet link will instead redirect the user to the product error screen. 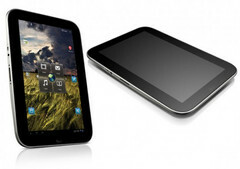 The same tablet was also spotted at a U.S. retail store with the $499 price tag as well. We’ve previously reported that the Lenovo tablet was rumored for a late June/July release, so the Amazon pre-order doesn’t seem to be too far off from the supposed release window. Lenovo has yet to announce an official launch date for the K1 tablet, but a July launch is now looking a bit more likely. The 10.1-inch, 1280x800 resolution screen tablet is expected to ship with Nvidia’s Tegra 2 APU, 1GB RAM, a microSD reader, micro HDMI port, SIM card slot and a proprietary “multi-function connector” likely for specialized expansions and peripherals. Android Honeycomb should be coming right out of the box as well, although Lenovo may be employing a heavily customized UI ala Samsung TouchWiz or HTC Sense.